We left Honolulu last night and are now staying in my “hometown,” La Jolla, California. 1) The hotel does NOT have shampoo that turns my hair into gummy worms (thanks, Hilton Hawaiian Village…). 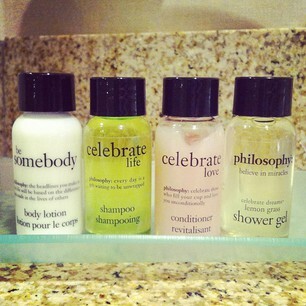 Instead, the hotel has all Philosophy bath products. Hopefully the cleaning ladies won’t see all the bottles that I’ve stashed away in my suitcase! 2) Nature. This place is beautiful. The scenery literally begs me to go outside. I ran all the way from La Jolla Cove to La Jolla Shores and back today — and didn’t even complain about that massive hill coming back (as I was too distracted by the beauty of the Pacific). We also took a hike in Torry Pines National Park. 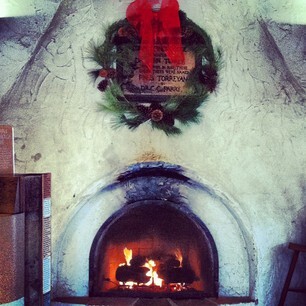 I have been going there since I was just a wee one, and I swear that the delicious pine smell gets stronger every year. 3) UTC shopping center. Home of three of my all-time favorite stores: Chuao Chocolates, Splendid, and the Body Shop. 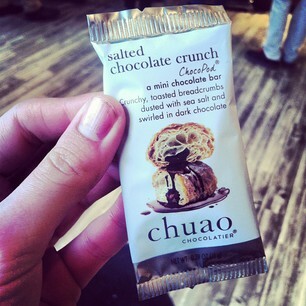 Chuao Chocolates has all sorts of delicious and unusual chocolate flavors — maple bacon anyone? I settled for a hot chai with cream and a mini bar of Salted Chocolate Crunch (dark chocolate with little croissant breadcrumbs in it). 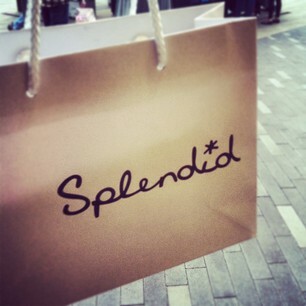 Splendid has the softest, simplest, most flattering and comfortable shirts in the world — there isn’t a Splendid store back home so I had to stock up. I know the Body Shop is EVERYWHERE. But today I got 3 body scrubs for free (buy three get three free) and I’ve never been more excited in my life (I have a different scrub for every day of the week!). 4) This is the final, yet most important reason that La Jolla and I were meant to be. La Jolla is home to my favorite restaurant on Earth: Bernini’s Bistro. I dream of their perfectly charcoal grilled chicken on a weekly daily basis. Despite many attempts, I have never succeeded in recreating their deliciously light (never oily) lemon salad dressing. In the cold days of winter, I crave their tummy-warming ginger carrot soup. I have never ordered anything I didn’t like here. 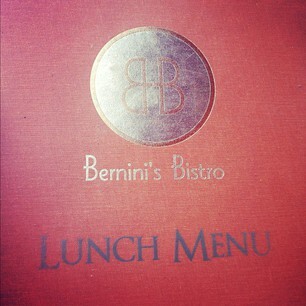 If you find yourself in the area, you must go to Bernini’s. 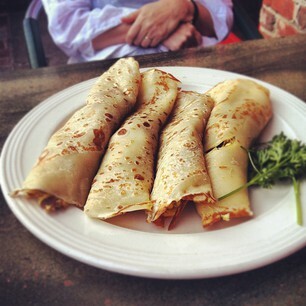 My mom ordered the Breakfast Crepes, which were out of this world delicious (I ended up stealing one!). Perfectly sweet crepes stuffed with eggs, bacon, tomatoes, and mushrooms. This is a dish I have to learn how to recreate at home. 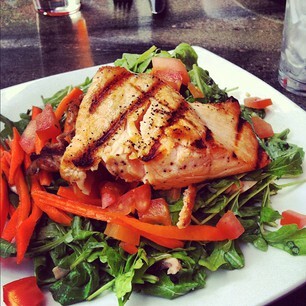 I ordered my favorite salmon salad. Their salmon is so succulent it literally melts in your mouth. Plus the lemon dressing is otherworldly.